Is This Deadline in Minnesota a Big Deal for the 2012 Primary Calendar? Minnesota law establishes February 7, one day after Iowa, as the default date for that state's caucuses. The date can only be changed with the consent of both political parties. The parties must, according to the statute, agree to change the date "no later than March 1 of each odd-numbered year" -- that is, tomorrow. That's interesting, but there are a few things that bear mentioning here. First of all, caucuses are different in terms of mechanics than primaries. No, that isn't a groundbreaking statement, but it is especially true in this instance. Primaries are state-funded affairs and that funding carries with it some state-mandated restrictions (eg: timing of contests). In caucus states, however, state parties foot the bill for those contests. As a result those parties have more freedom in terms of setting the date on which their delegate selection event is held. In the Minnesota case there is the added layer of a state with a statute regarding caucus timing. But the law is only effective to an extent. The state parties provide the funding and ultimately have the final say in when the caucuses will be held.1 Let's take Minnesota in 2008 as an example. The law in 2007 as other states nationwide were repositioning their primaries and caucuses in anticipation of active nomination races in both parties called for the precinct caucuses in the Land of 10,000 Lakes to take place on the first Tuesday in March. In July, Minnesota Republicans moved from March to February and the Democratic Farm-Labor state central committee followed suit in late August. It wasn't until 2008, during primary season, that the state legislature changed the law (202.A.14) shifting the date of the precinct caucuses from the first Tuesday in March to the first Tuesday in February and added the March 1 deadline in the process. This seems like more of an effort to organize/coordinate the caucuses between the two parties than anything else. Minnesota's Sutton said he was unfamiliar with other states' rules, but that he believed the state party didn't necessarily have to follow the timing set out in state law -- something that has soothed the nerves of some in the traditional early states. He also said he's not aiming to disrupt the process, and believes that despite the state law, he can move his party event's date at will if it becomes disruptive. Attendant to that is the idea that the national parties can hypothetically lean on state parties to comply with their will more so than they can state governments. That may be less a function of the national parties' strength than it is one of state governments flexing their muscle against a penalty regime with little or no bite. This case seems like less of an issue than, say, Utah where there is no legislation to move the Beehive state's February 7 primary and where the legislature adjourns next week. That is more problematic to the national parties. 1DFL Chairman Brian Melendez raises the point about the party funding the caucus on page 5. William March at the Tampa Tribune has put together a nice piece on the back and forth among early state GOP chairs, the RNC and the various actors/decision-makers in Florida over the timing of the Sunshine state's 2012 presidential primary. It isn't or shouldn't come as a surprise that the powers-that-be in Iowa, New Hampshire, Nevada and South Carolina are up in arms over the potential for Florida -- or Florida's state legislature -- to stand pat with a January 31 primary that would disrupt the national parties' plans for a later start to the vote-casting portion of the nomination process in 2012. "I would not be averse to pulling the convention if Florida doesn't follow the parameter of the rules," said Karen Floyd, party chairman in South Carolina, one of four states approved by both parties to hold early primaries. "There's nothing off the table," Floyd said. Presumably that would include severely cutting back the size of Florida's delegation to the 2012 Republican convention or refusing to seat them at all. Now, my previous statement about these statements not reflecting the reality of what is possible is probably not entirely fair. This process has some give and take and the early states have to pull out everything they can to protect their position whether it will or can actually happen or not. It is a PR battle to ramp of the urgency of the situation and dispatch Florida and other rule-breaking states with as little public infighting as possible (or at least to do it now when fewer people are paying attention compared to the fight occurring during primary and caucus season next year). Bitner said he hopes for a compromise in which Florida would get the fifth spot, immediately after the four early states. This is really all Florida Republicans -- those within the state legislature and elsewhere anyway -- want: to be that all-important second round behind the early states, but before Super Tuesday on the first Tuesday in March (assuming all the other non-compliant states cooperate). Of course, Bitner is between a rock and a hard place on this issue. Despite wanting to avoid sanctions and a potentially damaging public dispute with the national party, he is powerless to compel state legislators to move the primary back into compliance. Bitner is, however, well-positioned to serve as a middleman on a potential compromise between the RNC and state legislators. What would Bitner have before him in that capacity? The Republican National Committee desires a later start to the primary season and has enacted rules to that effect. Florida legislators and others want the Sunshine state to have an influence over who is ultimately chosen as the Republican nominee and they have come up with several good arguments as to why. First of all, those Florida Republicans in favor of keeping the primary where it is have maintained all along that it is not their wish to jump in front of the party-designated early states (They aren't really jumping at all.). They seemingly want to establish Florida as an early state; not the earliest among them, but the latest of the earliest states. Proponents of the January primary also astutely point out Florida's position as a swing state in the general election. In other words, pick a nominee Florida Republicans like and increase the chances building an organization there in the winter/spring and of winning the state in the fall. But can that compromise work? In a vacuum where only the Republican National Committee and Florida state legislators are party to this decision, perhaps. But that simply isn't the reality of the situation. Let's assume that the two sides agree on this compromise and Florida is able to pass a law that moves the state's presidential primary to the last Tuesday in February. This also assumes that the RNC has issued a waiver of some sort to the state (a process that exists on the Democratic side, but I'm unsure of for Republicans). That solves the Florida problem, sure, but there are still six states scheduled just a week later than where Florida is now that have yet to propose or advance legislation to shift the dates on which their primaries are scheduled to be held next year. A compromise would then have to be made with those states. How would the national party deal with them? It would seem that those states would want a position similar to Florida's -- Why Florida and not us! -- and if those states shifted their contests back to that last Tuesday in February date with Florida, the Sunshine state's influence would be diminished in the process. And decision-makers in Florida don't want that. To top it off, those in the state legislative leadership know this already, so they aren't going to budge. Now, the national party could make the same Florida's-importance-in-the-general-election argument to other currently non-compliant states, but that is likely to fall on deaf ears in a scenario where state actors are compelled to maximize their state's influence or barring that ensure that the state's, in this case, Republican voters at least have a say in determining who the nominee is (by holding a contest that comes on or before the time in which the nomination is effectively over). Sequence and process matter in all of this, too. Florida is not going to unilaterally move with several other non-compliant states still scheduled in February and with no signs of moving their 2012 contests. Florida is also limited in that regard in terms of when the state can act to move the primary. The state legislature there convenes on March 8 and will wrap up its business in May. There will still be non-compliant states that will not have adjourned their state legislative sessions at that point in May. Those states could still move, but those other states where legislatures have adjourned will not have that option and thus cannot guarantee that Florida, by moving to late February, will be able to serve as the second round after the exempt states and before Super Tuesday. The bottom line is that Florida holds all the cards and can hold their ground and let the RNC come to them with a solution or simply let Iowa, New Hampshire, Nevada and South Carolina jump them to "resolve" the issue. 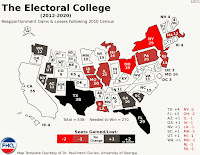 In the end, the RNC will have to cave because they don't want to do anything to hurt the GOP's chances in a state that is likely going to be a valuable part of either party's electoral vote calculus in 2012. In January FHQ posted a partial version of the Republican Delegate Selection Rules for 2012. The partial and outdated (The link was based on the recommendations from the Temporary Delegate Selection Committee.) nature of that version and more likely where I place Iowa, New Hampshire and South Carolina on the 2012 Presidential Primary Calendar got me a call from the legal team at the RNC. Their intent was to keep FHQ apprised of the party's adopted delegate selection rules and to share with us the rules (in full), the intent behind them and some history of how they came into being. The RNC draws a distinction between at-large delegates and those allocated based on the congressional district vote. A state scheduled prior to April 1 is required to allocated at-large delegates proportionally, but has choice and can continue to allocate congressional district delegates on a winner-take-all basis (win the district, win all the delegates from that district). The vote share threshold for candidates receiving delegates can be no higher than 20%. In other words, if a state set that threshold at 20% a candidate would have to net at least that much support to receive any delegates. A candidate can still receive all the delegates from a state if that candidate surpasses a minimum threshold set by the state. That threshold can be no lower than 50%. A candidate could, then, clear the 50% mark statewide and take all the delegates. If Utah had operated under these rules in 2008, Mitt Romney, by virtue of having won 89% of the vote, could have taken all of the Beehive state's delegates despite the primary having been in February (assuming Utah used the threshold rule). 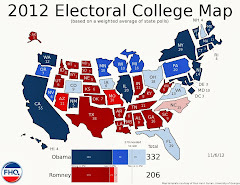 There are currently 33 states -- including Washington, DC -- with delegate selection events scheduled before April 1, 2012. Of those 33, 19 states would be required to make changes to their delegate allocation rules in 2012 compared to the state-level plans in 2008. The remaining 13 either already had proportional allocation, required a certain threshold to trigger winner-take-all allocation or did not allocate delegates during the first step of the caucus/convention process. If current legislation that proposes moving presidential primaries is passed the total of states being required to make a change in allocation rules from 2008 to 2012 will drop to 15 (since California, Maryland, Massachusetts and New Jersey would shift to post-April 1 dates). 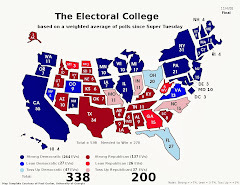 Those 15 states made up 747 total delegates or 31% of the total 2380 delegates and 63% of the 1190 delegates needed for the 2008 Republican nomination. That is a great many delegates in states that will have to be allocated slightly differently in 2012. Of course, the question remains whether that difference will create a substantive change in who emerges as the nominee for the GOP next year. Finally, Kentucky is unique because the legislation there calls for shifting the primary from May to August. As August is not included in the color coding, white designates that potential move with the May shade of blue. Iowa, New Hampshire and South Carolina appear twice. The earlier entry corresponds with the latest possible date these states would have if Florida opts not to move their primary into compliance with the national party rules. The second, later entry for each of the non-exempt states reflects the position the national parties would prefer the earliest states to hold their delegate selection events. 2 The Nevada Democratic caucuses date is based on both DNC rules and the state party's draft delegate selection plan as of February 25, 2011. On Wednesday, Idaho governor Butch Otter signed H 60 into law. Among other things within the omnibus elections bill, the legislation moves the Gem state's presidential primary (and those for state and local offices that occur concurrently) up one week from the fourth Tuesday in May to the third Tuesday in May. Though Virginia may not be far behind in terms of moving the date of its primary, Idaho becomes the first state to move for 2012 during the 2011 state legislative sessions. And contrary to most states considering a date change, Idaho is moving forward and not back. I don't know that this headline ("Florida Threatens to Start a 2012 Primary Stampede") really fits the article that follows. The general focus is on Florida and the potential for the state legislature there to defy the national party rules and keep the Sunshine state's 2012 presidential primary in January. But there is not really anything after that that describes anything close to the massive 2008-like movement of states or why that would occur if Florida does nothing. Of course, the headline implies it. And I suppose that sentiment is understandable given the experience with Florida in 2008. That, however, is a false premise. With the rules changes that both the Democrats and Republican coordinated -- pushing the starting point for all non-exempt states back to the first Tuesday in March -- most states that have proposed moves have proposed moving back to comply with those rules. By comparison, there are only two states with bills before their state legislatures currently proposing to move their presidential primaries forward. And one of those states, Idaho, isn't really a threat because the move in the Gem state is only up a week from the fourth Tuesday in May to the third Tuesday in May. Texas, then, stands as the only state with a bill within the legislature to move its primary forward. That doesn't seem like much of a stampede. In fact, the real issue behind the development of the 2012 presidential primary calendar continues to be the states that are already scheduled early and in violation of the national party rules. They are already there. The cattle stampeded in 2004 and 2008 and the inaction now isn't so much a stampede as it is running in place. Now, if Texas actually moves to February, well, that might set off a flurry of movement. But even then state legislatures will be constrained by bill introduction deadlines and beyond that the looming end of most legislative sessions across the country. More than a third of the states have early Republican presidential primary elections scheduled next year that would violate national party rules, throwing the campaign calendar into disarray and risking sanctions that would diminish their influence at the nominating convention. I've got to outsource the graphical presentation of my data to the Boston Globe more often. Is Florida Culpable in a Potential 2012 Primary Mess? After SB 128 moved out of the Committee of Ethics and Elections and into consideration from the Committee of the Whole -- garnering a "Be Passed" label from each -- the state Senate voted today to pass the bill canceling the Sunflower state's 2012 presidential primary. The move will save the state $1.3 million during fiscal 2012, but the cancelation and the savings are not all that surprising. Kansas has voted to suspend the presidential primary during each successive presidential nomination cycle since they last held a primary in 1992. The House is considering a similar bill. Hat tip to Richard Winger at Ballot Access News for making me aware of the action in the Committee on the Whole. There has been no lack of state legislative action to move or cancel 2012 presidential primaries during the first two months of 2011. With the national parties coordinating the development of the calendar aspect of their respective delegate selection rules -- settling on a first Tuesday in March start date for all non-exempt states -- most of that proposed movement in active legislation in state legislatures is backward and not forward thus far in the 2012 cycle. That can have implications for how the candidates approach certain states strategically. Depending on how the calendar ends up, and which states are where, certain candidates could have advantages over their counterparts. Most of this discussion has focused on the first four states; that Romney might skip Iowa or that he will do well in New Hampshire and Nevada. But what is missing is a look at what might happen after that. Much of that will, of course, depend on what states end up forming that second tier of contests behind the four exempt states. That is why the evolution of this particular primary calendar is consequential. Where does the formation of the second tier currently stand? Some states have proposed legislation to shift the dates on which their presidential primaries are held, yet others have not. Is there any pattern that has emerged in the states where legislation has been introduced and those early states that have to this point remained inactive? Well, actually there is. 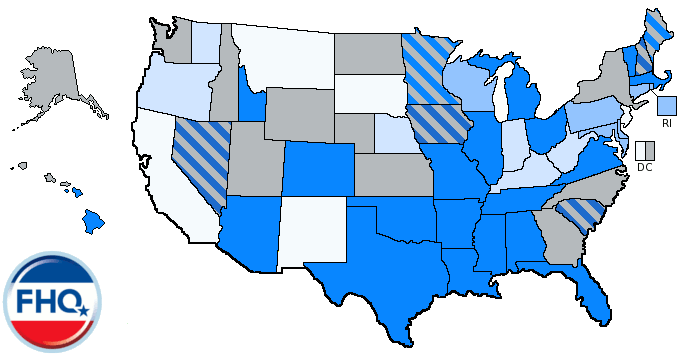 There are 18 primary states with 2012 contests currently scheduled out of compliance with national party rules. That list expands to 19 if Washington, DC is included. Of those 19 states (highlighted in yellow and green in the map above), eight have proposed legislation to move their presidential primaries back (Those states marked by a black circle.). Ten of those states were states in which Mike Huckabee either won the primary or placed second to John McCain. The remaining nine states were ones where Mitt Romney either won or came in second to McCain. While the overall division is nearly even, the distribution of states with legislation to move primaries to later dates saw decidedly more Huckabee support than Romney support in the early 2008 contests. Six of the eight states with legislation work its way through state legislatures were Huckabee states. And of the two Romney states one, Florida, has shown a certain resistance to moving despite Democrats having proposed legislation to move the primary back into compliance. If the seven states with active legislation to move their primaries move back (excluding Florida) that would leave a second tier of 12 states; eight where Romney enjoyed success in 2008 and four where Huckabee won or was the runner-up. Now sure, it is early in the state legislative session, but there is an interesting pattern that has surfaced behind the states that have been either active or inactive in moving their 2012 delegate selection events. Have at it Romney supporters and detractors. It has become clearer and clearer that Florida Republicans in the leadership in the state legislature are resistant to moving the Sunshine state's presidential primary into compliance with the national parties' rules on delegate selection. What has struck FHQ over the last week or so is the amount and type of coverage this has been getting. There have been headlines or comments about Florida "shredding", "blowing up" and "wreaking havoc" with the 2012 presidential primary calendar. That may be the case, but I think it overstates the extent to which that is true by falling back on the example of the delegate battle between Hillary Clinton and Barack Obama over the state in 2008. It is easy to link up the negative implications from 2008 with the same sort of potential state versus national party conflicts in 2012. But it unfairly heaps all of the blame for the situation on the state of Florida. And there is more than enough blame to go around here. As a starting point, I should probably go ahead and say that I've been pointing to the Florida conundrum since December 2008. I don't say that to boast, but merely as a means of highlighting the fact that this is not and should not have been news. Now, to people who tune in and out of the presidential nomination/election process it may be news, but it should not have been to the national parties. Both parties should have been mindful of Florida's position on the primary calendar in 2012 and should have devised rules or more to the point, penalties with Florida and the other non-compliant states in mind. The Republicans did alter their delegate selection rules, but did not change the 50% penalty it places on delegations from states that violate the rules on timing. It could be argued that the shift from state parties deciding how they allocate their convention delegates to the proportionality requirement for all pre-April states is something of a penalty, but I'm not convinced that is the case. Yes, it is still early in terms of presidential primary movement -- early in state legislative sessions in a period that sees the most movement -- but there is no evidence that states are actively moving away from the proportional window (pre-April) and to the winner-take-all window (April and after). One could make the point that with fewer states seemingly moving forward, the proportionality requirement is working as a deterrent. However, that too, is a rather thin argument. The states that were left behind in March, April, May and June in 2008 are states that are not frequent movers or traditionally have not been. That they didn't move during the 2008 cycle when so many other states were frontloading their contests should at least be some indication of that. The states that have had the most freedom to move in the past, then, are the states that are scheduled in February or earlier and have to move back to comply with the national party rules. Some are moving back, but they aren't moving back to take advantage of bonus delegates or to gain the freedom to decide how to allocate their convention delegates. No, those states moving back to comply with national party rules, but are opting for the most part to position themselves on the earliest possible date; a date that places them in the proportionality window. So while the Republican National Committee made what could arguably be described as fundamental changes to the party's delegate selection rule, they essentially did nothing to prevent rogue states from challenging the primacy of Iowa, New Hampshire, Nevada and South Carolina. To be fair, the Democrats did not change their delegate selection rules much either, but because the party is unlikely to see a contested nomination race next year, observers are deprived of seeing whether the DNC having caved to the seating of Florida and Michigan delegates at the 2008 convention -- after the kerfuffle that stretched through primary season and into the summer -- will impact the future application of the state- and candidate-specific penalties the Democrats utilize. It should be noted that the 2008 Democrats largely steered clear of Florida and Michigan while their Republican counterparts did not. The other irksome thing about the treatment of Florida in the wake of the legislative leadership's apparent defiance is that the decision makers are being portrayed as actively doing something to mar the 2012 primary calendar. In actuality, it is the state's potential inaction that is the story. No states are actively moving forward in 2012. Instead, because the national parties shifted the earliest date to hold nominating contests back to March, the question is one of states moving back or not moving back. Rogue states in 2012 are not like rogue states in 2008. The 2012 version is the state that ignores the national parties' desires and does nothing. And on that point, Florida is but one of twenty states or districts that have to make a change. Seven states and the District of Columbia have legislation to move back, but twelve other states have yet to make any move at the state legislative or state party level. Florida just happens to be the earliest of those states and is necessarily the first domino that will have to drop. But there are others -- Arizona, Georgia, Michigan and New York most prominently -- that are also in violation of the national party rules, that have to this point in the cycle been quiet in terms of moving their delegate selection events and that could also threaten the scheduling of contests that the RNC and DNC had in mind when they finalized their respective delegate selection plans last summer. Florida can take some blame, but there are other, later states that are also in violation of the rules that the national parties did not have the foresight to alter knowing this could or would be an issue. But the bottom line is that there is enough blame to go around for this situation. It stretches beyond just what is happening -- or not happening -- in Tallahassee. John Thune (via Facebook and his website) has withdrawn his name from the list of candidates vying for the 2012 Republican nomination to focus his efforts on the Senate. The South Dakota senator joins Mike Pence as the only prospective Republican candidates to announce anything -- in or out -- in terms of a run for the White House. Two outs and no ins at this point. Section 1202. The presidential primary shall be held on the first Tuesday in February in any year evenly divisible by the number four, and shall not be consolidated with the statewide direct primary held in that year. Section 1202. The presidential primary shall be held on the first Tuesday in February in any year evenly divisible by the number four and shall not be consolidated with the statewide direct primary held in that year. Notice the difference? I didn't either; not at first anyway. It's that comma before the phrase, "and shall not be consolidated with the statewide direct primary held in that year." I have no idea what difference that comma's exclusion makes. However, that the bill is sponsored by the Republican leader in the state Senate, Bob Dutton (R-31st, Rancho Cucamonga) reads like some implicit endorsement of the current schedule for primaries in the Golden state. As a refresher, California separated its presidential primary from its state and local primaries for the 2008 cycle. Instead of all of the elections being held concurrently during the first week in March, the presidential primary was shifted to the more advantageous February position while the primaries for state and local offices were moved back to June where presidential year primaries had historically been held in the state prior to 1996. Legislation on the Assembly side (AB 80) has been introduced to re-couple those two sets of primaries, but in June 2012. Given that late date and the fact that it will likely fall after the point at which the Republican nomination will have been decided next year, it is understandable that California Republicans in the state assembly would be opposed to the measure. That may be the reality they face as the minority party, however. Still, whether SB 782 is motivated by concerns over the timing of the presidential primary in 2012, it represents the most non-substantial of non-substantial changes to election law one can imagine. UPDATE: It turns out that comma strikethrough was a legislative maneuver to "create" a change in the law to beat the bill introduction deadline in the California Assembly last week. Changes can be made later in committee, but a bill had to have been introduced by February 18. Thanks to Richard Winger at Ballot Access News for the information. New York GOP to Switch to Proportional Delegate Allocation in 2012? Last week, Tennessee House Democrats proposed a bill (HB 760) that would shift the state's presidential primary back from the first Tuesday in February to the first Tuesday in May. The Democratic leadership on the state Senate side has now followed suit. Minority Leader Jim Kyle (D-28th, Memphis) introduced SB 1875 last Thursday (February 17) which would have the impact of scheduling the presidential primary concurrently with municipal elections held in May. The intention of Democrats in a time where budget deficits are a real concern on the state level is likely to prioritize elections outlays. However, it is much easier for the minority party Democrats to do this in a cycle where the party's standard bearer is likely to receive no concerted opposition in the primaries next year. Majority party Republicans, with a contested nomination to come in 2012 are more likely to balk at this as a result. Tennessee has moved its primary the last two cycles -- from the second Tuesday in March to the second Tuesday in February in 2004 and from the second Tuesday in February to the first Tuesday in February in 2008. Legislators in the Volunteer state, then, have had a recent history of moving the state's presidential primary around to maximize the state's influence. The reality is that legislators there have merely moved the state into a period of time before or simultaneous with a decision on the nomination having been determined. Tennessee has not proven decisive, but it has been a part of the decision. And while Tennessee Democrats may have the thought of the bonus delegates that are awarded to later primary states, they are unlikely to see those with Republicans in control of the state government and a contested nomination race on the horizon. If one was to place bets on which set of primary bills will emerge, one would have to wager on the primary moving to March and not May based on partisanship and partisan control alone. However, this is yet further evidence of 2012 primary laws being crafted with budgetary concerns at least secondarily in mind. Pass it on: Virginia and Idaho moved closer to shifting the dates on which their respective presidential primaries will be held next year. In Virginia, the two bills that had already passed one chamber and had crossed over to the other for consideration both passed last week. That clears the way for Governor Bob McDonnell to sign into law the bill(s) that would move the presidential primary from the second Tuesday in February to the first Tuesday in March. Idaho is seeking to move in the opposite direction. The bill moving the primary (presidential and state & local primaries) up one week from the fourth Tuesday in May to the third Tuesday in May passed the Senate last week -- after having earlier passed the House -- passed the Senate and awaits Governor Butch Otter's decision on whether to sign it. Both Virginia and Idaho would become the first states to move their 2012 primaries during the 2011 state legislative session. Rerouted: In Oklahoma, one of the bills proposed to shift the presidential primary in the Sooner state back to the first Tuesday in March (from the first Tuesday in February) has been removed from the Rules Committee and re-referred to the General Government Committee. Of the three bills in Oklahoma to propose this move, HB 2138 is the broadest in scope, changing not only the presidential primary date but the date for statewide and local office primaries as well (from July to June). The other House bill and Senate bill are still in their respective chamber's Rules Committees. Introducing...: In Missouri, bills were introduced in both chambers by the Republican chairs of the relevant committees dealing with elections to move the Show-Me state's presidential primary from the first Tuesday in February to the first Tuesday in March -- in compliance with national party rules. In Tennessee, the Republican leadership in both legislative Houses introduced new bills that seemingly augment the original legislation to move the Volunteer state's presidential primary to March. The new versions addressed filing deadlines as well, but would have the same impact on the primary's timing as the legislation introduced earlier. In a twist, Democrats in Tennessee have come up with an alternative plan that would move the primary from February back to May to coincide with municipal elections. Though the cost savings may be tempting to the Republican majority, the state having at least a vote in who the Republican nominee will be -- or having an early enough primary date to warrant that -- likely trump that concern. Can you hear me now: In Washington state, the movement to cancel the 2012 presidential primary had public hearings before committees this past week. The Washington Republican Party had come out against the Senate version of the legislation in earlier hearings, but this time, on the House side, state Democrats voiced concern based on a potential movement by the party in the direction of utilizing the primary for delegate allocation as opposed to the caucus system the party has traditionally used in the state. That said, the party did not seem to come out in opposition to the bill; it only raised the issue of using the primary. Of those 18 primary states, 15 of them (California, Connecticut, Missouri, New York, Arizona, Georgia, Delaware, Tennessee, Wisconsin, Maryland, Michigan, New Jersey, Utah, Oklahoma and Virginia) have convened their 2011 state legislative sessions. Of those 15 states, 7 (California, New Jersey, Oklahoma, Maryland, Missouri, Tennessee and Virginia) have bills that have been introduced and are active within the state legislature to move their contests' dates back. Both California and New Jersey have bills that would eliminate an early and separate presidential primaries and position those events with the other primaries for state and local offices. That would mean June presidential primaries for both states if those bills pass and are signed into law. In the remaining states, the efforts are to simply shift the states' presidential primaries from dates in violation of the two major parties' rules to the earliest allowed date (the first Tuesday in March). There is also an active bill in Washington, DC to move the districts primary back to June. For this next week the 15 early states in conflict with the national parties' rules will be the ones to watch. They will not be joined by any additional states this week or for that matter the rest of February. Alabama will be the next February primary state to convene its legislative session on March 1. How would all of this look if all these bills happened to be passed and signed into law? States with active bills to move their primaries are listed twice, once where law has them currently and once in bold and italicized for where active legislation could move them.NOTE: THIS IS NOT THE CURRENT CALENDAR, ONLY WHAT IT COULD LOOK LIKE IF CURRENT LEGISLATION IS ENACTED.